The eighteenth season of British science fiction television series Doctor Who began on 30 August 1980 with the serial The Leisure Hive, and ended with Tom Baker's last story Logopolis. Season 18 sees the swan song of Tom Baker as the Fourth Doctor, ending his time after seven years on the program. New companions Adric (Matthew Waterhouse), Nyssa (Sarah Sutton), and Tegan Jovanka (Janet Fielding) make their introductions in Full Circle, The Keeper of Traken, and Logopolis, respectively. Romana, played by Lalla Ward, departs from the series in Warriors' Gate, along with John Leeson who returns to voice the robot K9. With the arrival of Adric, this season marks the first time since 1967 that the show has given the Doctor a party of three travelling companions. The Master returns to the show, this time played by Geoffrey Beevers, in The Keeper of Traken. After the events of Traken the Master is played by Anthony Ainley, who would continue to play The Master for the rest of the classic series run. Jacqueline Hill, who plays the First Doctor's companion Barbara Wright, returns in Meglos, although this time playing the one-off character Lexa. For Season 18 John Nathan-Turner replaces Graham Williams as producer. Barry Letts returns as executive producer, for just this season. Christopher H. Bidmead also replaces Douglas Adams as script editor. In a return to the format of early seasons, virtually all serials from Seasons 18 through 20 are linked together, often running directly into each other. Three serials – Full Circle, State of Decay, and Warriors' Gate – are part of a trilogy within the season. These three serials include the arrival of Adric and the departure of Romana and K9. Over the period of Christmas 1980, the season took a two-week transmission break between the broadcasts of State of Decay and Warriors' Gate. In search of a holiday, the Doctor and Romana travel to the famous Leisure Hive on Argolis, a planet ravaged by a nuclear war with the reptilian Foamasi years earlier. The main attraction of the Hive is a device called the Tachyon Recreation Generator, but when things start to go mysteriously wrong with the machine, the Doctor realises that evil is afoot in the Hive. He and Romana begin to unearth a tangled conspiracy which may lead to a new, deadlier war between the Argolins and the Foamasi. The Doctor is summoned back to the planet Tigella, where the population is divided along religious and scientific lines. Something is going terribly wrong with Tigella's main power source, the Dodecahedron, but the Savants are prevented from investigating by the zealous Deons. To make matters worse, before the Doctor can solve the problem with the Dodecahedron, he is accused of its theft. The true culprit is Meglos, a shapeshifting Zolfa-Thuran, who intends to unleash the full might of the Dodecahedron upon the universe. Romana is recalled to Gallifrey, but en route the TARDIS is drawn through a Charged Vacuum Emboitment into another universe, called E-Space. Landing on the planet Alzarius, the Doctor meets a group of humans who are trying to rebuild their spacecraft which crashlanded generations ago. When Marshmen begin rising from the swamps during the dreaded time of Mistfall, however, the Doctor realises that there is something amiss on Alzarius, and begins to unravel a genetic riddle which stretches back centuries. Still trapped in E-Space, the TARDIS materialises on a medieval planet. The townsfolk live in fear of the Three Who Rule, who govern from their mighty castle. Investigating, the Doctor discovers that the Three Who Rule are ancient astronauts who were turned into vampires long ago, and their castle is actually their spaceship. When Romana and Adric are kidnapped, the Doctor must ally himself with a band of renegade peasants to stop the resurrection of one of Gallifrey's greatest enemies: the Great Vampire itself. Trying to escape from E-Space, the Doctor, Romana, Adric and K9 instead land in an eerie white void whose only feature is a crumbling old keep. Also trapped in the void is a slave ship captained by the cruel Rorvik, whose time sensitive pilot, the leonine Tharil Biroc, escapes and lures the Doctor into the keep and the mirror gateway beyond. There, the Doctor witnesses the rise and fall of the once-mighty Tharil Empire. He realises that he must free the Tharils enslaved on the ship and escape through the gateway, before Rorvik's vengeful actions destroy them all. The Union of Traken is governed by a Keeper gifted with the powers of the Source. The current Keeper is nearing the end of his thousand-year tenure, however, and asks the Doctor and Adric – who have escaped from E-Space – to go to Traken and stop an evil he believes is plotting to destroy the Union. But the source of the evil, the Melkur, has already infiltrated the Consuls of Traken, and has the Doctor declared a criminal. Allying himself with Consul Tremas and his daughter, Nyssa, the Time Lord must uncover the true power behind the Melkur – someone who knows the Doctor of old. After her aunt is murdered by the Master, an airline stewardess named Tegan Jovanka becomes an unwitting stowaway aboard the TARDIS as it travels to the planet Logopolis. There, the Doctor discovers that the Master's interference with the Logopolitans' advanced mathematics has unleashed a wave of entropy which threatens to consume the entire universe. The two Time Lords enter into an uneasy alliance. Their only hope lies on Earth... but then, in the moment of greatest crisis, the Master plays his ultimate trump card. The entire season was broadcast from 30 August 1980 to 21 March 1981. 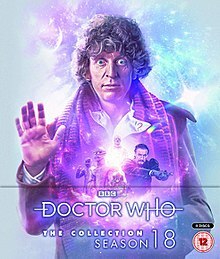 All serials of season 18 were released individually in between 2004 and 2011, and the complete season will be released as a Blu-ray boxset in 2019. Only available as part of the New Beginnings box set in Regions 2 and 4. Released as Doctor Who: The Collection – Season 18 in Region B. ^ "Doctor Who - The Collection - Season 18 - Limited Edition Packaging [Blu-ray] ". Retrieved 27 November 2018 – via Amazon. ^ "Doctor Who - Tom Baker: Complete Season Seven [Blu-ray] ". Retrieved 7 December 2018 – via Amazon. This page was last edited on 19 March 2019, at 22:21 (UTC).